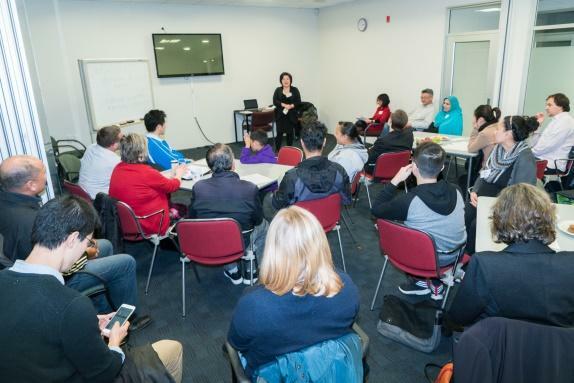 First of all Network of Skilled Migrants Manawatu is grateful to the PNCC for funding this event which is one of a series, that aims to link skilled migrants to employers. The September networking event “Network for Success” attracted around 30 participants. The speakers, who were invited, were business owner Arunee Srichantra and Elaine Reilly from Feasible Business. It was a great pleasure to have them at this event. Arunee, originally from Thailand, has been living in Palmerston North for 17 years and gained her PhD in Food Technology at Massey. She shared her experience of establishing a business. Since 2005 she has been the owner of Chada Thai restaurant and opened her second restaurant in 2011. It was very interesting to find out from her, that when she was a student Palmerston North was a very quiet and small city compared to today. A strong motivation, being persistent and passionate about her business helped her to go through the difficulties and stay on track. Her degree helped with the legislation around food safety and handling. She then went on to study business management and finance which helped her to handle the financial side of her business. It was emphasized during this time in business, that good communication and treating her customers like they were your relatives helped to grow her business. Word of mouth is the most common advertisement for a food business and it’s very clear that she has been very successful in this area. There were many questions from the floor to Arunee: what made you start a business, what was the most difficult time, what was the most appropriate marketing for your business etc? It was important for her to have a balanced life where she could look after her family, earn a living and do what she likes to do, cooking for people. Elaine Reilly is also a skilled migrant and she is from Scotland. She is a business leader of 25 years of experience with a background in Psychology and has a black belt in Karate. Her company helps organisations get the most from their people and chairs two boards and also is helping NSMM. The important object for networking is to know what you want from the networking. Start networking by introducing yourself, begin a conversation by making small talk, pay attention when you talk using “tell me more…”. Practice networking and building relationships with your contacts and most of all be proactive. Ask questions like “What do you do?”, “What is your expertise?”, “What are your ambitions?” It was great fun practising networking. We have some photos of that below. Attendees could get answers to their questions. The questions had to be stopped due to time limitations. It was good to listen to Caius, member of the NSMM who shared his experience of being a member. Through NSMM he has met many local businesses and made connections. NSMM had two prize draws and Chada Thai donated a prize which was won by Aleksandra. The two other prizes were won by Catherine Robinson and Talman Chhetri. The evaluation results tell us that most people are interested in starting up their own business, followed by an interest in improving their knowledge of kiwi work culture and networking skills. Also on the list was improving English language and job seeking skills. We will work on those ideas for our future event planning.